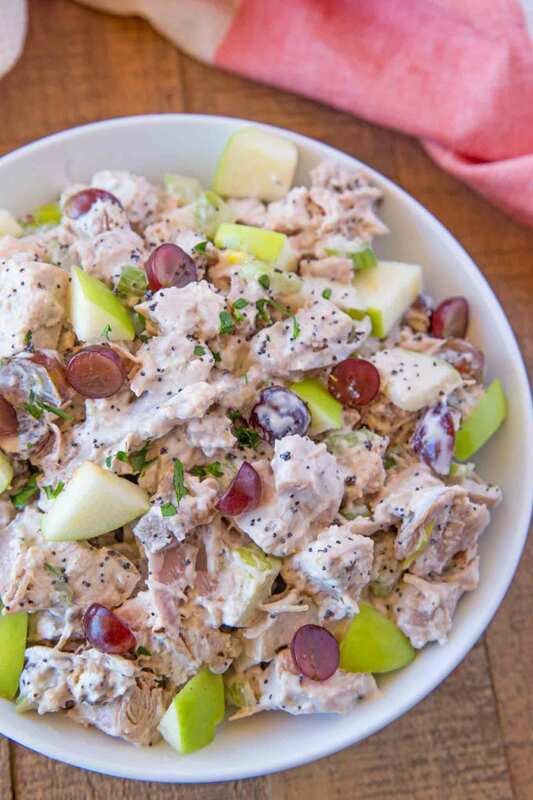 A healthier Waldorf Chicken Salad made with greek yogurt, mayonnaise, grapes, apples and walnut is a creamy salad topper or sandwich filling you can enjoy for lunch. 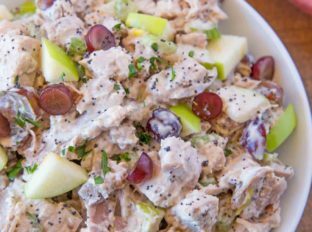 Waldorf Chicken salad was one of the recipes I used to make into sandwiches for tea time parties I used to create for clients. In those instances I would cut up the food into a very fine dice, include a bit more of the creamy yogurt and mayonnaise and put it into tea sandwiches that I crusted with the finely chopped walnuts. People went bananas for them. Yes, like b-a-n-a-n-a-s bananas. We used to love enjoying the leftovers so much I began making them for our own lunches. My secret ingredient (not super diet-friendly but not terrible either) was the Trader Joe’s Slightly Sweetened Walnuts. We love those walnuts and I add them into all my salads and we snack on them too. They’re even amazing on cheese boards. Add the chicken salad over lettuce and sliced tomatoes, stuff it into a pita pocket, wrap it in a low carb tortilla wrap or if you’re not on a strict point regimen stuff it in a delicious croissant! Replaced 85% of the mayonnaise with Fat Free Greek Yogurt. 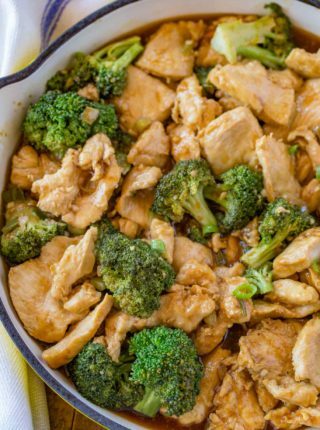 Use chicken breast instead of chicken thighs. Cut way back on the amount of walnuts. Added poppy seeds to add extra texture with no additional points. 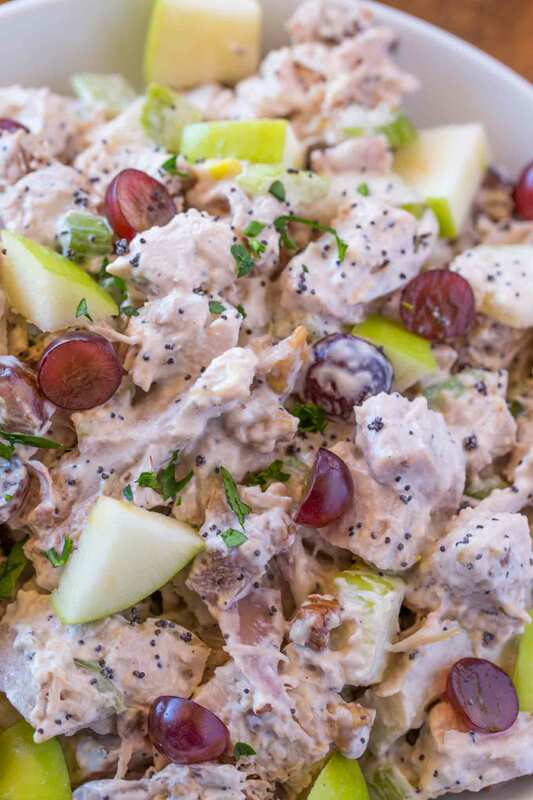 Make the chicken salad ahead of time but sprinkle on the walnuts instead. 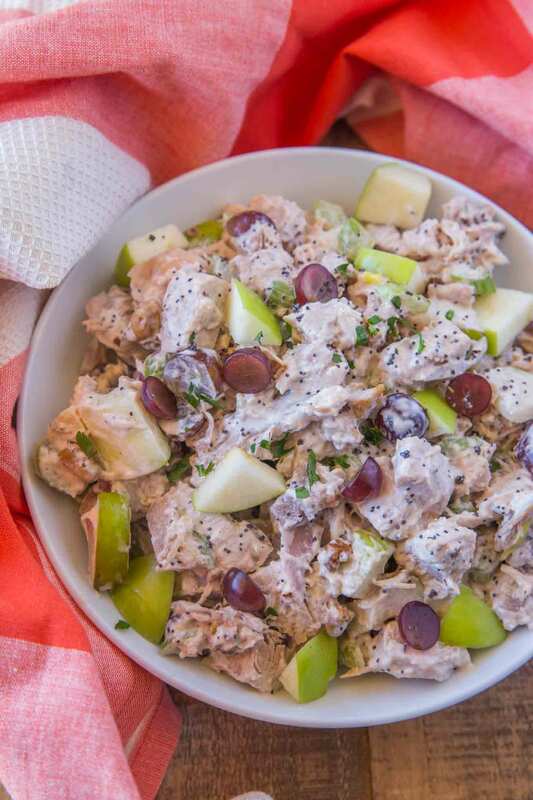 Toss the apples well in the salad to coat well. Keep the grapes whole to prevent too much liquid releasing. If packing as a sandwich add whole lettuce leaves to both sides of the bread or tortilla before adding in the chicken salad. For additional fresh lemon flavor add lemon zest on top. Trader Joe’s Slightly Sweetened Walnuts: Not in the nutritional facts on this page but try them, they are amazing. 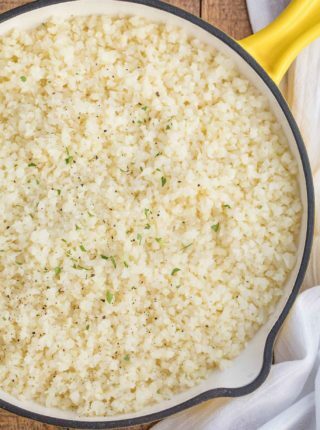 Add all the ingredients into a bowl together and mix well. 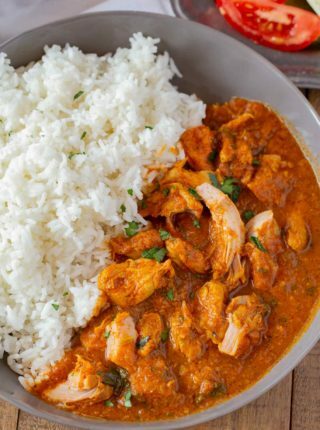 I think you just found my lunch for the rest of the week! I had forgotten how much I love this salad! I can’t wait to try this again soon! What a delicious-looking salad. I love adding grapes to mine too and I love your prep-ahead tips. Such a great recipe! This looks so good! Thanks for all the tips on ways to use it! 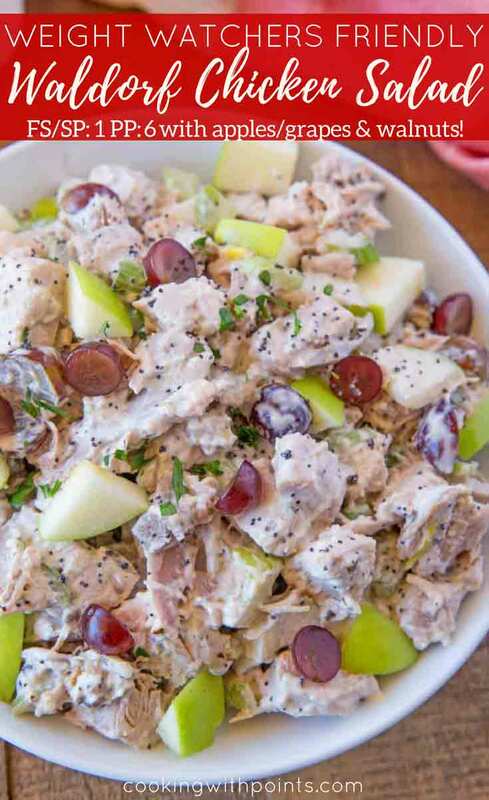 This is a lovely chicken salad recipe! I looove the poppy seeds in it, too! 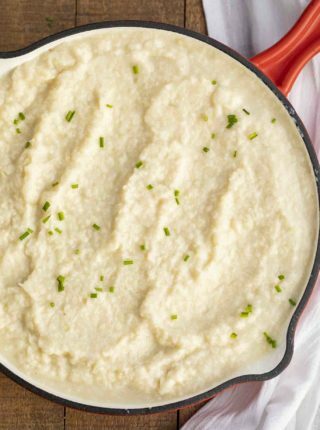 Greek yogurt is such a great alternative to mayo – can’t wait to try this. I am new to your website and the recipes look wonderful. However, you do not post the WW points. That would be very helpful. Sorry, I wish I could as I was a big fan of their program. Their legal team reached out to me and they made it very clear they don’t want people sharing points as it is their intellectual property. I asked many times but was told no.